An imaginative and entertaining collection of duets all with a dance-related theme. 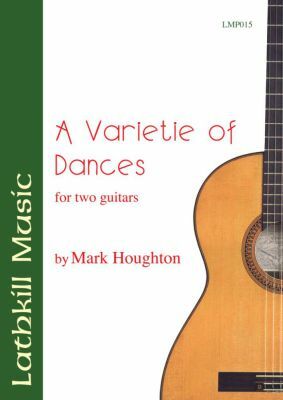 Tangoesque, op.24 (two tangos simply titled Tango 1 and Tango 2) has lots of exaggerated syncopations and contrasting sections whose themes are shared between the two guitars. Cavatina, op.17 is a slow, lyrical and soulful dance contrasting sharply with the following up-tempo Dance in D, op.19, a lyrical folk-like piece originally conceived as a finale to the Cavatina. Arabesque, op.8 concludes the set in an exciting finale drawing on Moorish influences. Mark Houghton won the Kilvington Memorial Prize for his composition at the Dillington Guitar Summer School and Festival 2000.